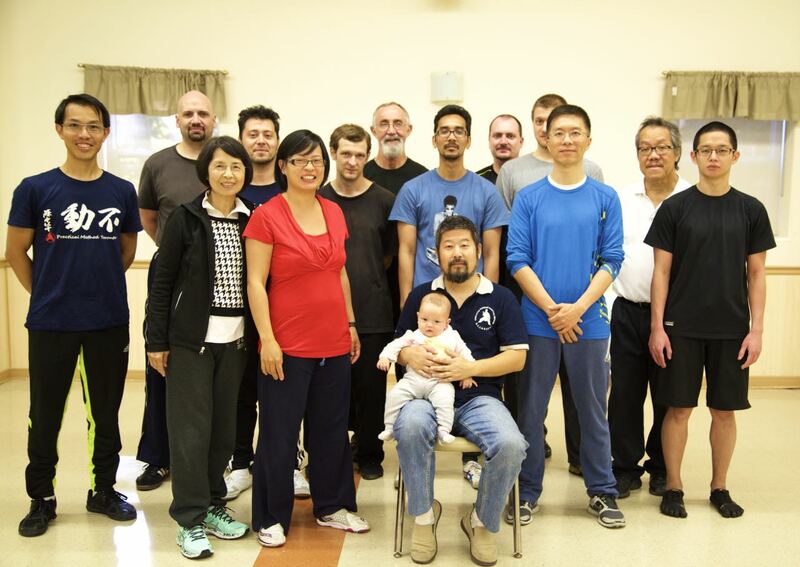 I just returned from a 3 day workshop in Toronto. I would like to thank Master Chen and all of the other participants for providing me with this learning experience. All of these notes are mental ones and I will make sure that I take down physical notes on subsequent trips. All errors and omissions are my own. I would like to thank Kelvin for calling me out on my note taking or lack thereof. I totally forgot how to be a good student. I believe that it is important to take notes as a) they will help you to remember what you have learned and b) some of the instructions are personal points of guidance that might apply only to you and as such will not appear in anybody else’s notes. 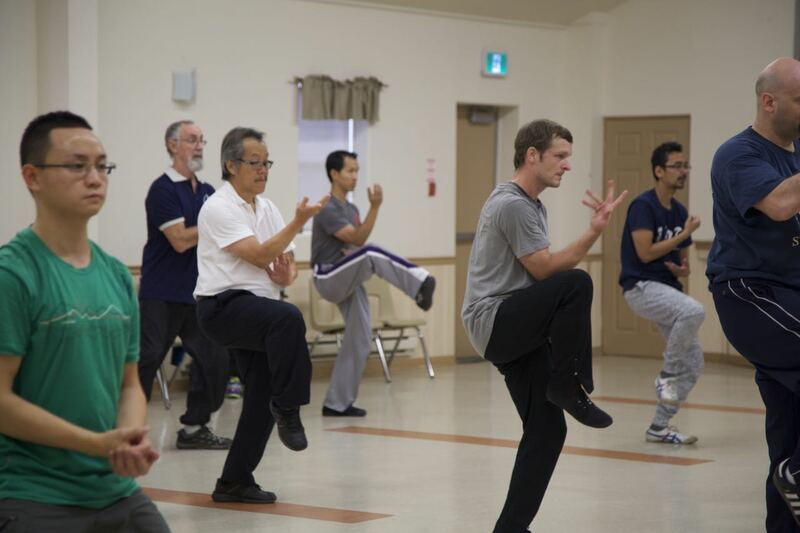 Clarity – taiji is separation of yin and yang and separation of yin and yang requires that the movements are purposeful, meaning that they are not made willy nilly, there must be a structure present and at the beginning stages the non-moving part must be differentiated from the moving part. One example pertaining to the actual workshop include the movements for “buddha’s warrior attendant pounds mortar”, after the left foot moves in and starts to shovel out the heel must reach its destination, toes must first land, and the forward thrust from the rear foot must create a straight line. The difficulty with this move is that the tendency is to add movements, instead of going completely forward, deviations occur where the body will either slightly pop up, move left, or move right. Another example is when moving the feet in lateral movements such as cloud hands there must be a stake present so that the side that is non-moving remains stationary. In “step back to double shake the feet” the upper body must not toss, the circles have to show clarity, including the footwork when stepping back, the same applies to the moving step positive circle. Stick, rope, rock – we need a rope to wrap around our opponent. When getting into position it is important to use his structure as a platform to pivot on for movement, so it does not become too telegraphed, or disengaged. Use of the lever requires that we create an actual stick on our bodies. How do you create that stick? Line up a pair of dots and lock the 2 ends, establish a real center. We need to put a rock under the stick to use the lever. How do you create a rock? Forget a rock become a mountain and don’t move! When attacked we want the outside to move and the inside to not move, when we are attacking we want the inside to move and the outside to remain static. Kua coming out – we need to learn to lead with the kua. It has been stressed multiple times that inside movements must be larger than outside movements. The tendency here is that once contact is made and a position is reached we tend to step back, or do other kinds of moves bringing the kua back. Master Chen asked me in jest to pronounce kua in which I attempted my version and he said, “that’s pretty good, most people say, gua, you must make the kua come out”. Gain – when pushing hands the primary objective is to get in and establish a superior position. There is still a lot of space left that needs to be taken out. Hold the position and continue to gain. I am not trying to equate taiji with Brazilian Jiu Jitsu, but there is a saying in bjj that goes, “position before submission”, it helps me focus on trying to gain space. Everything into one dot – extremely difficult to do! Isolate a dot on your own body. We tried to do this by bouncing ourselves off of the wall. The feeling is that the point should be propelling our bodies forward. Find the source of power on your opponent (shoulder, back, etc.) and hold that dot. Line up the dots and everything goes into the one dot. Aim – the fingers should continue to point towards the opponent’s center. Aim requires the use of intent. It is real, but not substantial. It is like a marksman with a rifle. The aim creates a straight line even though we cannot see the line. In the case of a sniper scope guided by laser this would be real and substantial as we can see the line created by the laser. Bypass – we must resolve conflicts through bypassing which requires the use of indirect power. Stretch the fingers and move outside. Remember that longer is stronger! This is the reason we would like to be connected to the rear foot. Understanding – do you understand? I understand it, but I can’t do it. It is important to note that if we understand, then we can do it. We are trying to perform real physical actions. Do not get caught in analysis paralysis. Don’t move is a principle, but once the instruction is given people get lost. If we think of this in terms of mathematics and set theory then don’t move would be the universal set, and subsets would include, don’t move the hand, don’t move the knee, etc. Try not to get caught thinking about the subsets. Follow the instructions. Strong – in philosophy there is an argument form called modus ponens that goes, “If P, then Q, P, therefore Q”. If I have taiji skills then I am relaxed. I am relaxed therefore I have taiji skills is a logical fallacy called affirming the consequent. We cannot form this conclusion and say that in order to achieve taiji skills we need to be relaxed. A house made of bricks is stronger than a house made of wood, or straw. Take any number of arguments and apply this structure and you will see that it holds. We are not talking about soundness which requires both validity and truth. If it rains, then the streets are wet. The streets are wet, therefore it rained. The counter argument is the city washed the streets in the morning. So the condition of the streets being wet was met without it having to rain. Power from the back and inside – in learning we must do away with our humanity. 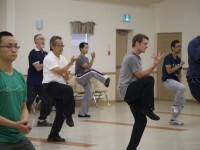 It is more difficult for a strong person to do taiji as he/she will have natural abilities which give him/her the strength to power through movements. The power must be internal; it must come from the back and inside. We must accept 2) because if we believe in 1) then we don’t need a teacher, if we accept 3) we are just doing random things. Listen, follow, learn! It is also important not to paraphrase as the instructions are precise. Fix 2 points break the middle fix the middle and manipulate 2 points outside – I can’t remember the Chinese phrase for this concept, but during the workshop we practiced this idea when we were doing the pushing and pulling. 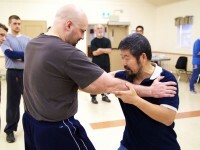 Master Chen demonstrated this by fixing the front kua and front foot and moving the knee. Power must move along the half pipe – when a bow is pulled back there is a lot of power radiating outwards as vectors in the space in front of it. There is a half pipe that is created between the legs while in the horse stance and power has to move between this space by activating the kua. Balance scale – in the beginning the dantien is used as the center. We are training to get the 50/50. Later on we can manipulate the lines of demarcation and do 60/40, 80/20, 90/10 etc. Taiji is a balancing act! We have to make our opponent feel stronger than we are. Master Chen mentioned that yilu is laying down the tracks and erlu is the derailment. We have to put our opponents on the track of our choosing and then chase them down. Excellent notes Sandy! Thank you so much for posting, I will be rereading your notes in the next while. Great notes! 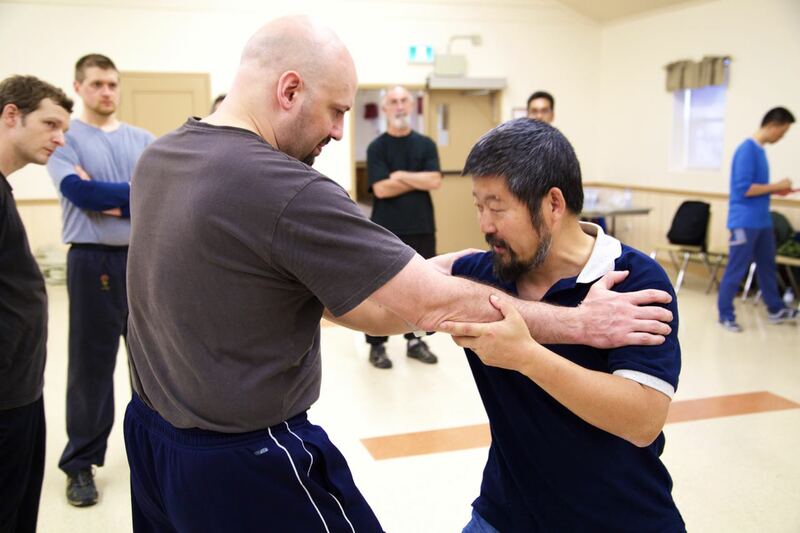 This captured a lot of the points discussed and practiced at this Toronto workshop. Fix 2 points break the middle. Thanks for the notes Sandy…I don’t know how you managed to remember so much without notes, but they’re really appreciated. Very detailed and useful notes. Thanks Sandy! Imagine that you are creating an invisible stick between you and your opponent. One end is at a dot on your back, and the other is at the opponent’s centre. Push from the dot on your back along this invisible stick deviating from the stick. Kelvin, thanks for the additional explanation. I meant “without” deviating from the stick. Just read these notes for the second time and am really beginning to see how much I am missing at workshops. I’m a crap note taker and if anyone has any suggestions how to better absorb and record information so that I could share my future observations with other students, I would greatly appreciate it. I read your notes and I think they are excellent. Do you remember that during the workshop Master Chen was giving an analogy about having tasted an apple? In that example only Master Chen and John were the two to have tasted the apple and then a third person by way of imitation or assumption comes to the wrong conclusion that it tastes like a banana. Taiji is learned through the doing. Notes and such are in the framework of the theoretical. I can probably sit here all day and write about how one thing links to another and give similes and metaphors all day, but the thing I believe is most beneficial is to treat workshops like a meal and not a buffet. We cannot consume all of this information in one go. Just take what is most relevant for you, note it, work on it and improve. At the end of the day your appetite has been satisfied and you can live to eat another day. Whatever may have been missed has a chance of being caught next time. Retention is key.